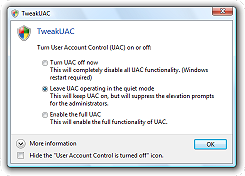 TweakUAC™ gives you more power over the Windows User Account Control (UAC) settings. In addition to enabling or disabling the UAC, TweakUAC also allows you to select the “quiet” mode for UAC. In the “quiet” mode, the security of UAC is fully enabled, except that when you use Windows as an administrator, you will not see the usual UAC prompts to approve actions that require the administrative rights. UAC is short for User Account Control, the security technology available in Windows Vista, and Windows 7, 8, and 10 that keeps programs from performing privileged operations without special approval from the administrator. Click the image on the right to see a typical message displayed by UAC when you attempt to run a program that requires special permissions. Am I at risk if I enable the “quiet” mode of UAC? Should I disable UAC completely? No, that’s not a good idea. When enabled, UAC makes available the protected mode of Internet Explorer, reducing the attack surface significantly should you come across a rogue web site. It also forces legitimate programs to behave well by restricting their privileges. If you disable UAC completely, you increase the chance that some system setting becomes corrupted due to an error in one of the “good” programs you use. Do I need TweakUAC if I use Windows 7, 8, or 10? Unlike Windows Vista, Windows 7, 8, and 10 come with a built-in UAC control panel that lets you reduce the amount of UAC messages shown. You can use that Control Panel instead of Tweak UAC, if you prefer. Or, use TweakUAC if you find its way of handling UAC settings better. It’s all up to you! Does TweakUAC work with 64-bit Windows? Yes, TweakUAC works with both 32-bit and 64-bit versions of Windows. I’ve enabled the “quiet” mode but now Vista is showing a balloon message telling me that UAC is disabled!? You can verify that UAC is ON by trying to enable the Protected Mode of Internet Explorer: it can only be enabled if UAC is ON. To stop the red shield icon from bothering you, use the Hide the “User Account Control is turned off” icon option at the bottom of the TweakUAC window. If you check that box, Windows Vista should stop displaying the alert. Note that you may need to log off and then log back on to Windows in order for the new setting to take effect. Also note that this option is only displayed if you use Windows Vista; it’s not shown on the Windows 7, 8, or Windows 10 computers, because they do not display the red shield alert when you enable the quiet mode of UAC.